I found a bloom for Bloom Day! 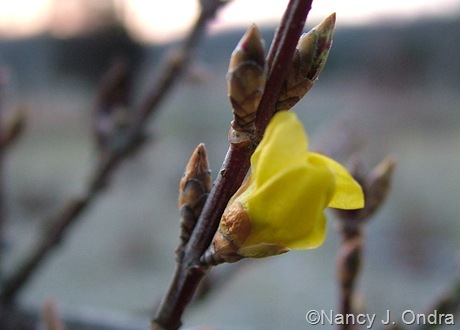 I brought branches of ‘Kumson’ forsythia inside a week ago, but they haven’t done anything. Outside, though, a few buds are just about open. Now, I’m off to see what the rest of you have posted in the main Bloom Day post at May Dreams Gardens.